With uncountable bits and bytes flying all around you and data transfer taking place at record bandwidth, important and confidential files and folders require a robust level of protection to keep you safe from illegal access by intruders and information spies. Files and folders that are left unprotected can become a direct victim of theft, loss, and breach of privacy and confidentiality. This can leave you in dire consequences! Given the omnipresent threat of physical theft or loss, data security is more important today than ever before. 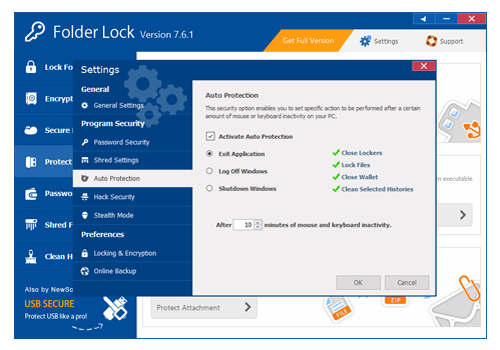 Thanks to today's promotion for Windows, you can meet all of your data security needs with a small but powerful software application called Folder Lock! Folder Lock protects your important data by locking it, hiding it and encrypting it with an unbreakable data protection algorithm. 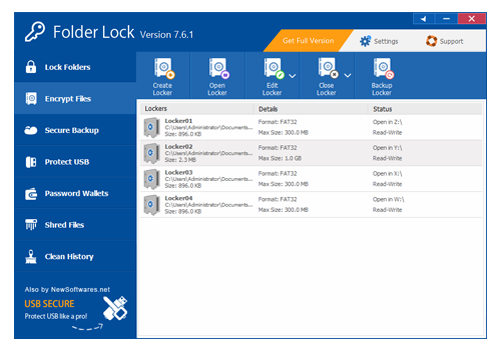 With the power of Folder Lock's seven security tools in your arsenal, you'll be able to lock down files, folders, and entire drives, safeguard your personal data in Wallets, shred files securely, and cleanse your Windows usage history. 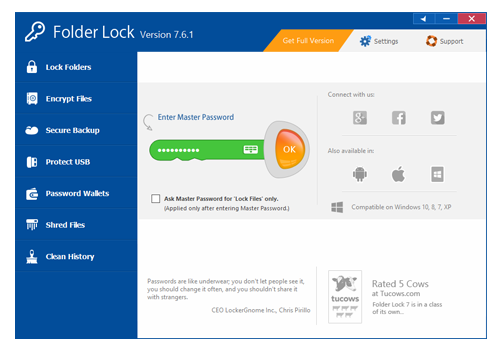 No other security program gives you the broad spectrum of features that are included in Folder Lock, such as app-level password security, hack security, auto protection, and even a stealth mode - compatible with both 32-bit and 64-bit Windows platforms. 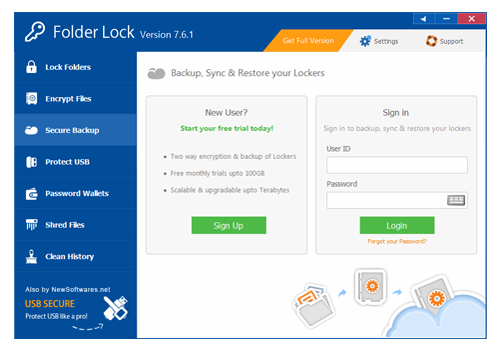 For encrypted storage, take advantage of Folder Lock's 'Lockers', which now support encrypted storage in network shares and servers for use by multiple authorized users. You can even use Folder Lock to convert any locker to an encrypted executable file that can live on a USB flash drive or CD for maximum safeguarded portability! Of course, you always have the option of having Folder Lock automatically back up anything that you place into an encrypted locker! And don't forget - lockers can't be deleted from the PC that has Folder Lock installed, nor can Folder Lock itself be uninstalled without the correct password! 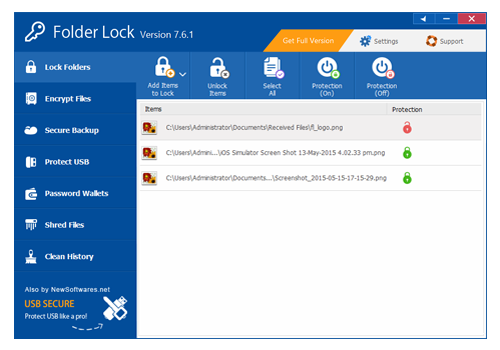 Lock Files, folders and drives in seconds. Encrypt files instantly with strong 256-bit on-the-fly AES Encryption. Convert your encrypted storages into executable and take your portable drives anywhere. Run Application in complete Stealth. Don't let anyone know you ever installed Folder Lock on your PC. Monitor, control and perform actions on incorrect password attempts. After you purchase Folder Lock it may be used indefinitely. 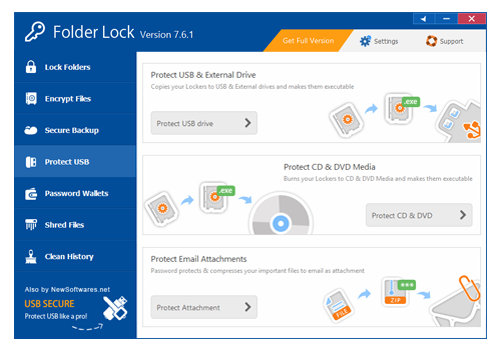 Folder Lock is licensed per computer, and not per user. “We have been searching for a while now for a reasonably priced; yet top quality piece of software that does exactly what it says. Thank you for providing this. It is worth every penny.”- Vic Christod, UK. Roberto Hello. I bought 2 licenses and got 1 serial number. Is that one valid for activating on pc and laptop? How I should do with folders like dropbox? I should use your cloud secure software? Can i enable/disable the cloud folders (while traveling/offline) and remove the lock when i use the computer? Stefan Hauber Does FolderLock run under win10? The last version of v6 was v6.6 before v7 was published. The current version is also 7.6. So I'm wondering: Is v8 just around the corner? And if yes, is v8 for today's buyers free? 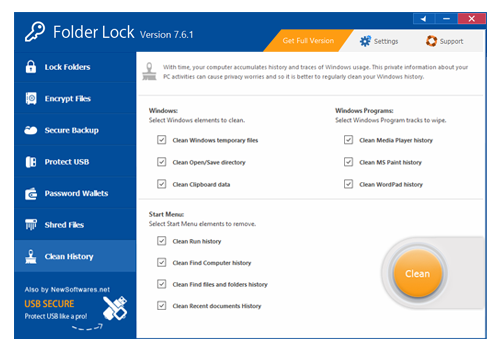 We would like to inform you that Folder Lock 6 is not compatible with Windows 8/10. 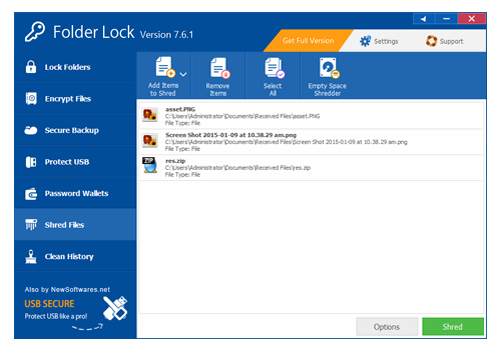 If you want to continue with Windows 8/10 then you have to upgrade your Folder Lock 6 to Folder Lock 7.6.8 latest version in discounted price. 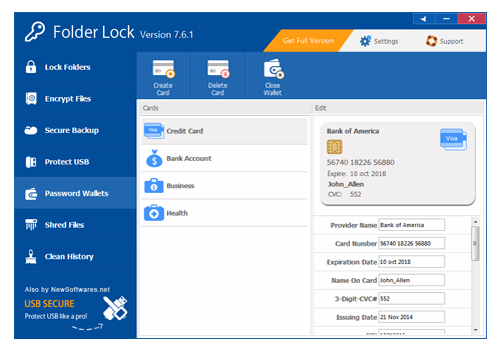 As our existing customer you are being offered a reduced price of just 29.95 USD to upgrade your Folder Lock 6 to Folder Lock 7.6.8. To avail this discount, please visit our order site at https://secure.bmtmicro.c...EFERRAL=SG and you will be able to get Folder Lock 7 for just 29.95 USD. nick stevens I jumped at the discounted offer and have just now asked for a refund. My bad that I didn't read the fine print which limits the license to one computer/install. I just reread the offer content and I compliment the writer for coming up with such a devious script. It makes one want to move forward because the benefits and features are so compelling.that one is led to believe that more than one install is included. As a rule, I never buy any software thatI can't use on my two laptops and one desktop. Why would anyone that synchs their files in this century??? Anyway, attempting to install on my second computer did not generate a specific error condition only that my trial period had expired and I needed to BUY NOW. Puzzled, I tried again to no avail even with an uninstall.I went back to my first install and that one too presented me with the same condition. Since it was still "normal business hours" I called and heard a message instructing that I should submit my inquiry via email??? I've seen that before so I tried calling #2 which produced a busy signal, end of that attempt. So, having no recourse, I sent an email expressing my frustration and displeasure that a non US company offering it's products in the US would not have a dedicated service line/customer service/tech support to assist it's paying subscribers. Chasing an offshore company for any degree of satisfaction is nearly always a long and often futile process. Today I received a reply curtly correcting me and instructing me just how their software installs really work making no reference or admission to the strange nature of the process. I wrote back to demand a refund. In the interest of full disclosure, I have used FolderLock in the past without such limitations or issues and was quite satisfied with the product. In this case, clearly they have changed their business model from install through support and the experience is sub par.As for the price vs value proposition, I find that their full retail price isn't justified because of the single installation limitation. . Lesson learned is to look deep into offshore software fine print before jumping aboard and pay dear attention to the exact nature of the license being issued. Bait and switch has found it's way into many industries. Software (s no exception. In summary, while the software may or may not stack up against the competition, this company has to address it's core weaknesses the least of which I have described her. Mappi75 Wow, never saw such a bad german translation in a program or any game in history! - Folder Lock is licensed per computer, and not per user. - Each license allows installation on 1 computer. Most of the of this programs are USER based or even offers a lifetime upgrade.